Are you a current RN in the senior living/senior care space and are looking for your next opportunity? Are you a recent nursing school graduate looking for your first career opportunity out of school? We are looking for a few good RNs to join the Prestige Family! We invite you to join us for this National Nurse Week networking opportunity.We’ll host beverages and hors d’oeuvres, as well as complimentary chair massages! 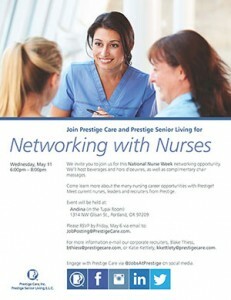 Come learn more about the many nursing career opportunities with Prestige! Meet current nurses, leaders and recruiters from Prestige. bthiess@prestigecare.com, or Katie Kettlety, kkettlety@prestigecare.com.